Mum saved this recipe from her bowling magazine, which published the same sort of down to earth recipes as the old PWMU Cookbooks that every woman had copy of back when I was growing up and every young cook, as I was back in the 1970s, was given. The cookbook was a fund raiser for the Presbyterian Womens Missionary Union and was full of recipes and useful hints. Along with everything else cookbooks have changed a lot since those days, but I still sometimes hunt through my copy for a good chutney or jam recipe. 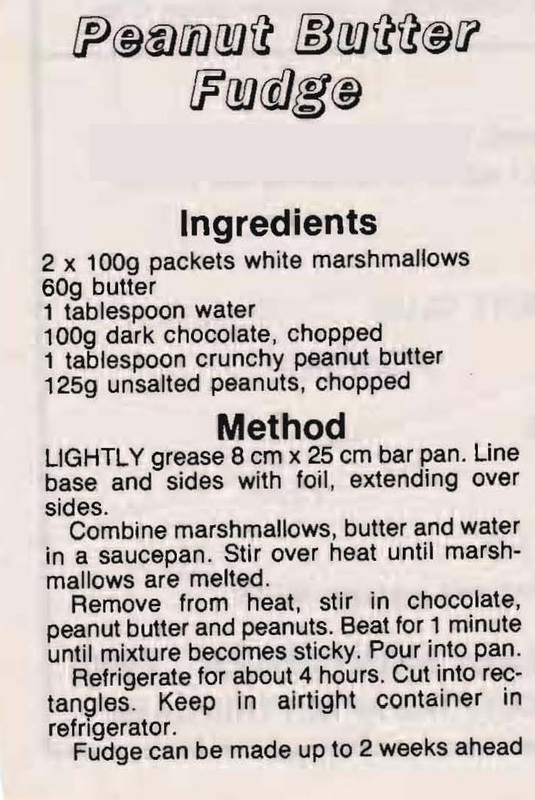 This entry was posted in All Recipes, Sweets & Fun and tagged 1980s, chocolate, marshmallows, peanut butter, peanut butter fudge, unsalted peanuts by bebsrecipes. Bookmark the permalink.